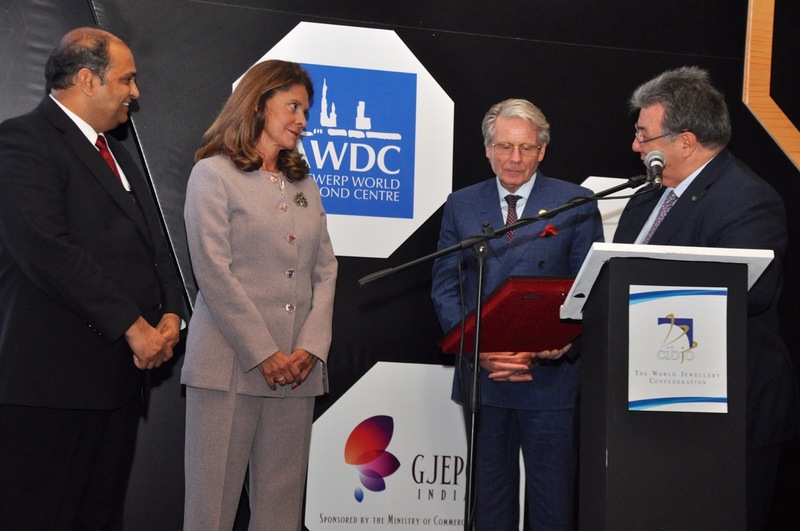 ABOVE: CIBJO President Gaetano Cavalieri (far right) presenting a gift to Colombian Vice President Marta Lucia Ramirez (second from left). She is flanked by Pramod Kumar Agrawal (far left), Chairman of India’s Gem & Jewellery Export Promotion Council, and Kenneth Scarratt, President of CIBJO’s Pearl Commission. 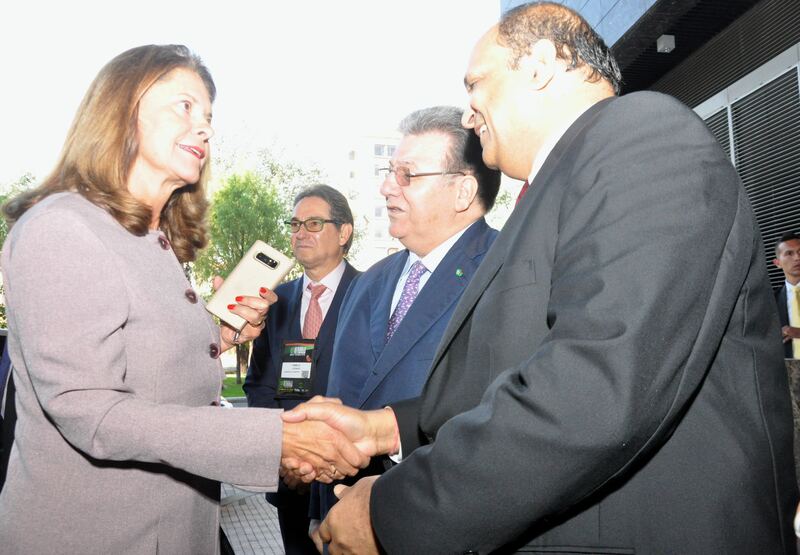 Colombian Vice President Marta Lucia Ramirez was a guest of the CIBJO Congress on its third and final day, addressing delegates as well as about 200 local members of the Chamber of Commerce of Bogotá’s Jewellery Cluster. She was greeted by CIBJO President Gaetano Cavalieri. 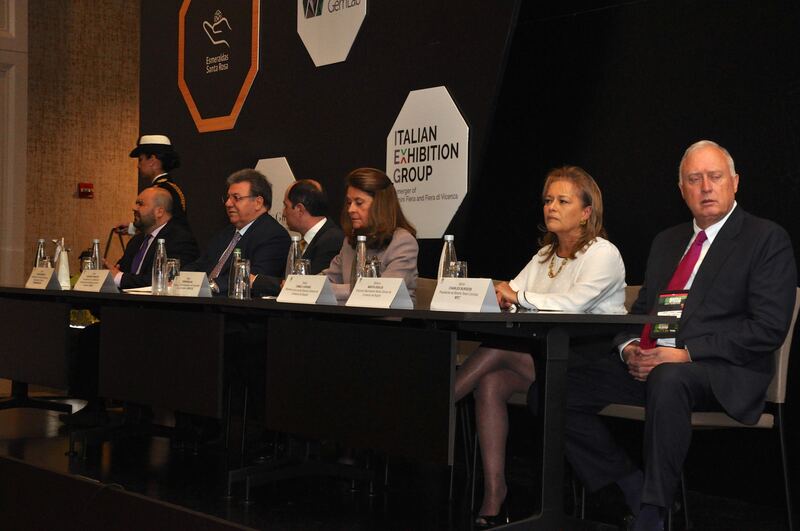 Addressing the gathering, she outlined challenges facing Colombia in general and the business community specifically, and she pointed to the growing importance and expansion of the Colombian jewellery sector. In this respect, Ms. Ramirez paid tribute to representatives of the country’s emerald and jewellery industries, who she said were leading the sector forward. 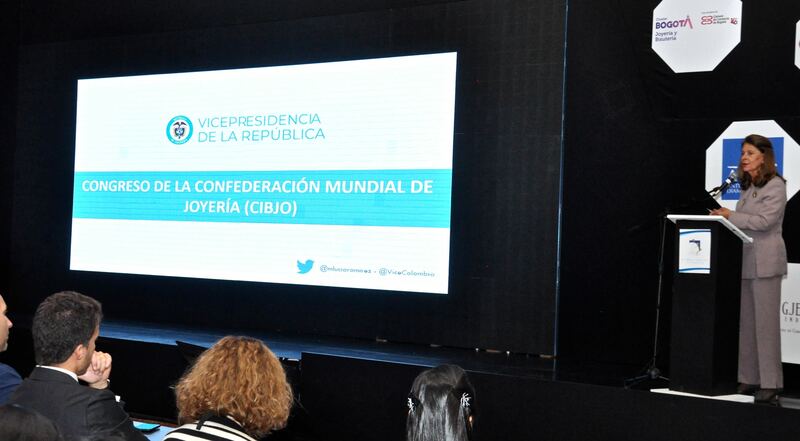 The Vice President said that deep-seated changes were taking place in Colombia and the government has ambitious plans for economic expansion, and also aims to close social gaps. The country will celebrate its bicentennial in 2019 and the country’s challenge is to create a unified state with inclusiveness for all its citizens, she said. The country has faced many challenges and security issues, she said, and the government was aiming to provide legal, economic and personal security for all Colombians. Among the key efforts being taken is the promotion of gender equality. 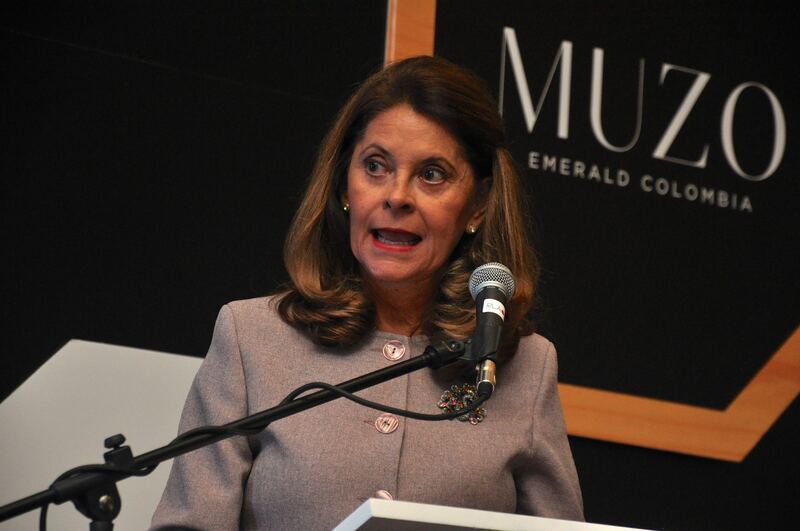 Relating to Colombia’s jewellery industry, Ms. Ramirez said that 35 percent of the country’s production is concentrated in Bogotá. 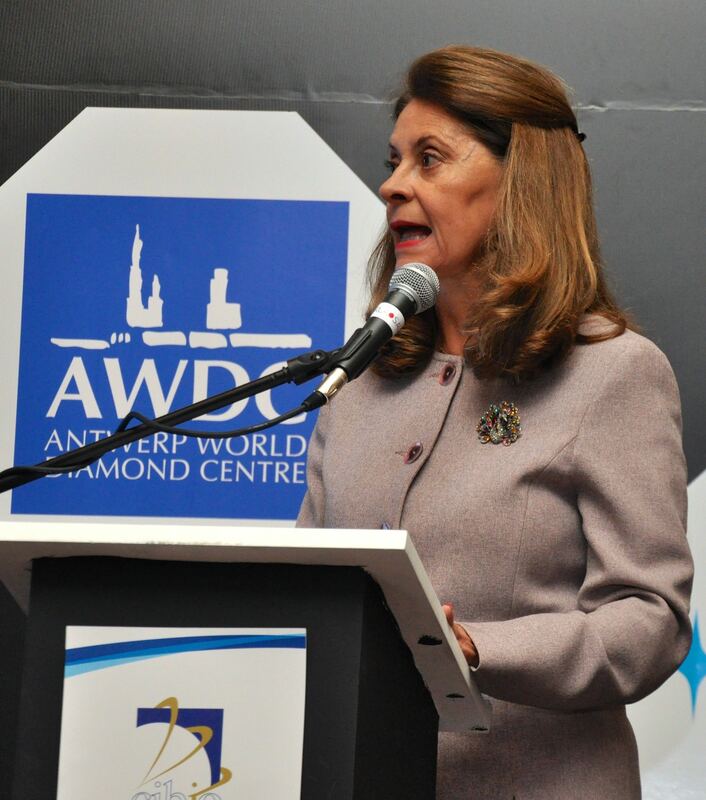 Although this could be seen as a natural state of affairs due to the city being the country’s capital, Colombia would nevertheless benefit from a diversification of the jewellery industry which would provide employment opportunities in other towns and cities, she stated. Colombia’s main foreign jewellery export destinations are the United States, with 39 percent of the country’s jewellery exports being sold there, followed by Hong Kong with 28 percent, Switzerland with 14 percent, Thailand with 8 percent, and Japan with 3 percent. Mrs. Ramirez addressed the issue of beneficiation of the state’s mineral resources. 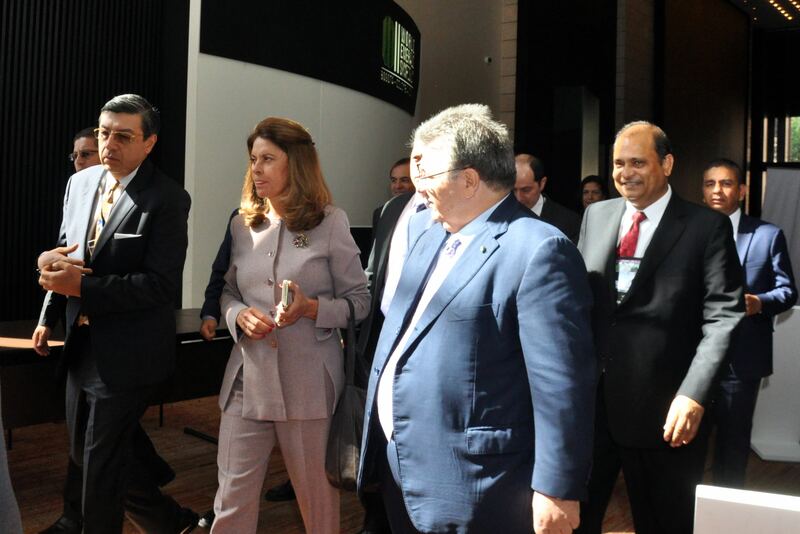 She said that Colombia needs to expend more efforts and resources in adding value to its minerals. This means exporting fewer loose stones and more finished jewellery products set with precious stones, she said. Illustrating her point, she presented exports statistics showing that exports of loose precious stones comprised 86.2 percent of total exports of stones, jewellery and costume jewellery in 2017. Meanwhile, finished jewellery products accounted for just 12.5 percent of total exports in the sector, while costume jewellery exports accounted for 1.2 percent. 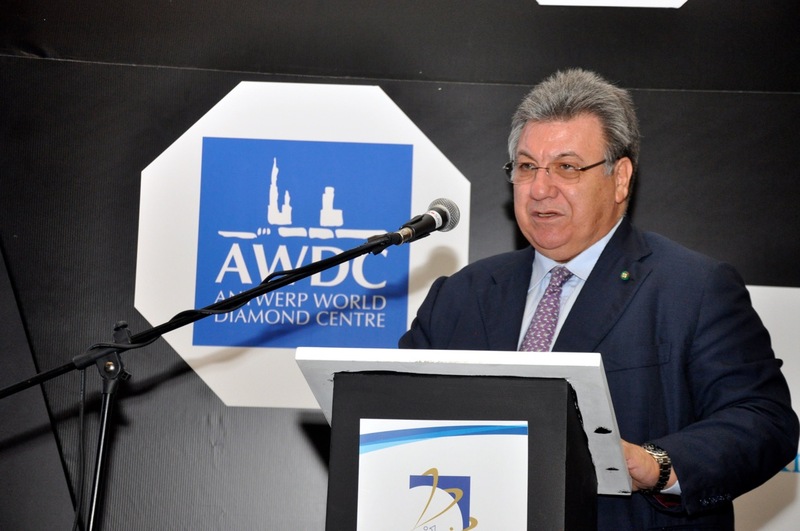 Exporting significantly more finished jewellery items will bring in higher foreign currency earnings, which the government can use for the economic and social development of the state, the Vice President stated.